What are portfolio stories for? Portfolio stories allow teachers to document evidence of their work over time. Create or adapt a learning set (ie. ‘Registered Teacher Criteria’, ‘Graduate Standards’, ‘Self-review’ or other assessment criteria that may be relevant to you as a teacher), then link your portfolio stories to your chosen criteria using the learning tags in these sets. Over time you can analyse and review your progress against your personal criteria. And you can link together your portfolio stories in eg. an Appraisal Goals plan. This makes support, reporting and assessment processes faster and easier. How do teacher portfolio stories work? A teacher portfolio story works in the same way as a child story, i.e. it is a story that can contain text, images, videos, PDFs and learning tags, but instead of selecting a child in the story, a teacher selects themselves. How can I create a portfolio story? 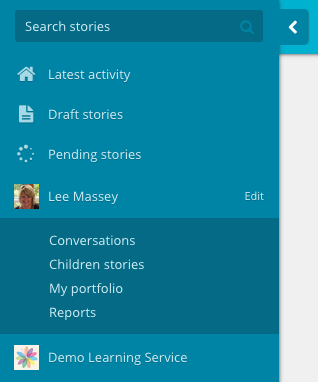 You can create a portfolio story from scratch, or duplicate a relevant child story to edit and save to your portfolio. Who can see portfolio stories? Portfolio stories are kept in a teacher’s personal portfolio and can only be seen by themselves and other teachers at their early learning service. How do I access my personal portfolio? When you publish a portfolio story it will be saved to your personal portfolio and also show up in your activity stream. You can access your portfolio by clicking on your 'My portfolio' link under your name in the menu. Or click the ‘My portfolio’ tab on your teacher’s profile page to see all your portfolio stories. What happens to my portfolio when I leave my current early learning service? Teacher portfolios are associated with individual teachers, not the early learning services they teach at. This means your portfolio will remain accessible, and free, to you even after you've left your current early learning service.